Imagine your News & Magazine Joomla site in multilingual, that is going to reach out a lot of audiences. Who wouldn’t like to read the world most popular news immediately when it is out in their own language? The impossibilities becomes real with JA Magz. All props go to our recently developed JA Multilingual Component which strives to taking over the burden of complication in setting up a Joomla multilingual site in just 5 steps. It transforms JA Magz to be available in 41 languages, which Bing currently supports. Here are the demo we build to prove the possibilities of JA Magz. For the sake of the database, we would like to keep it at 20 languages for now. Some of you might got freaked out and wondering how excessively heavy JA Magz is going to be with all these languages built in. No worry, mate! The quickstart and the template files are just going to be shipped with JA Multilingual extension only. We leave it up to you to choose which languages you like to install and cling onto. Here is the quick video tutorial on how you can do so after successfully install JA Magz on your site. JA Magz is extremely customizable. Does that look neat? You can move those modules around if you like, or add/remove/resize them if you feel like it. 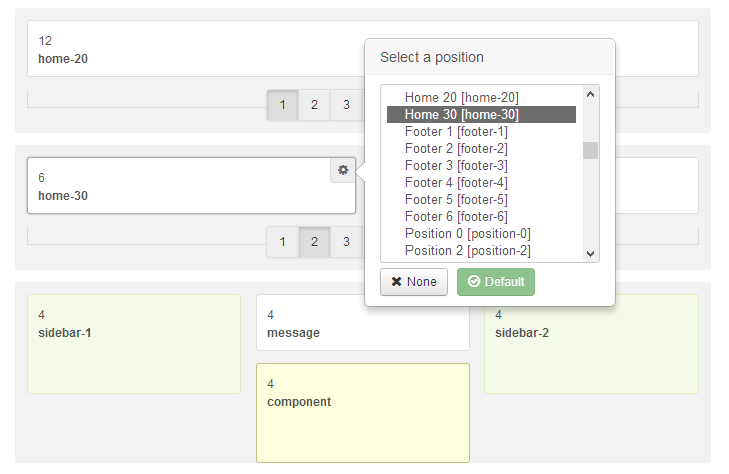 You can fit up to 6 modules with width of 2 for each row or snap all of the modules off and get a full width slider. That is all on you to decide on both Widescreen or Mobile layout. Flexibilities and Full control over the template. With no exception, JA Magz is a fully responsive Joomla 2.5 & Joomla 3 template that looks astonishingly on whichever screen it is. RTL lovers are no longer missing out especially with JA Magz. 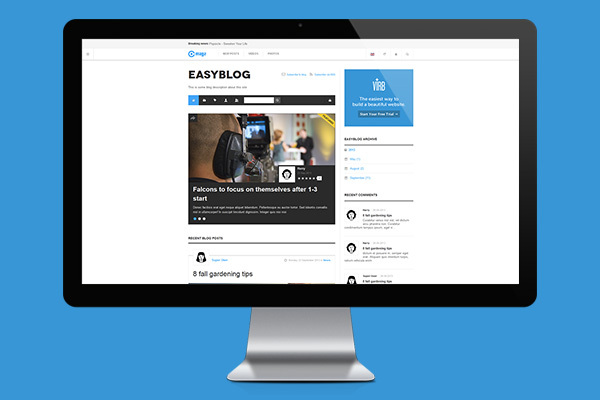 >EasyBlog component is also featured in this template. Apart from all amazing features EasyBlog embraces, it just fits so well with all the design elements in JA Magz. 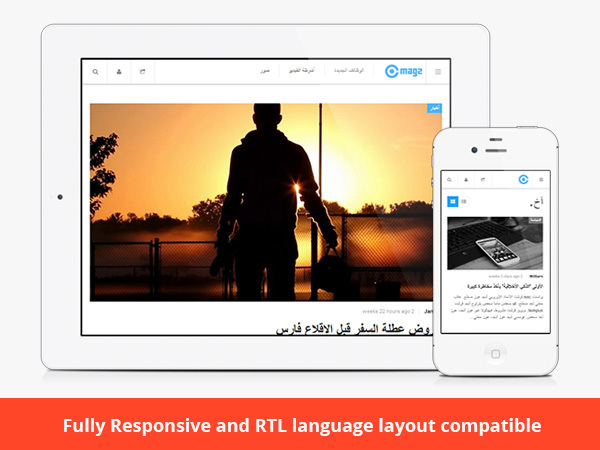 JA Magz is a Joomla News & Magazine template. That means the content plays a really really REALLY important role here. The content can come from various collaborative copywriters located almost everywhere. Understanding this fundamental, JA Magz now grants your copywriters the freedom of collaboration in content. It enables authors to create and edit articles directly on the front-end without the whole complication of explaining to them the back-end logistics. If you would like to get those articles translated immediately after they gets posted, quickly run a round of JA Multilingual extension and you’re all set to go. Each author also has their own profile page, which is a custom feature for JA Magz only. 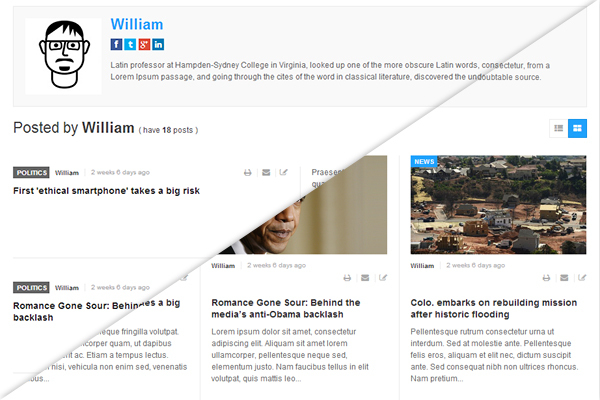 On this particular page, you can choose to view all the articles of this author in either Grid view or List view style. This feature is applied to all the other categories pages as well for both desktop and mobile version.